This rich combination of vanilla, copal and amber brings to mind the feelings of cleanliness, purity, freshness and innocence. Its fragrance will change the mood of your whole day. 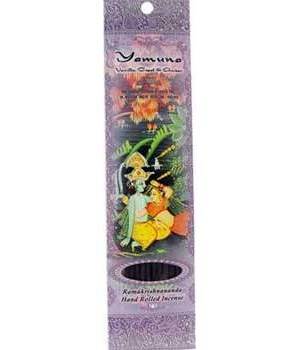 Yamuna was the first incense offered by Prabhuji's Gifts and remains the best seller. After lighting a handmade stick of Yamuna incense, sit to meditate, practice yoga, read a book or simply... be.... Yamuna is the river of love in which Krishna and his beloved Gopies enjoyed their divine play. The trees on its banks still tell us of their glories.